Evan Lewis's recent posts about Dashiell Hammett and the Continental Op have put me in the mood to reread some of Hammett's work. I haven't gotten around to doing that yet, but when I ran across a copy of this 1983 biography of Hammett at Half Price Books, I didn't hesitate to pick it up. Not only am I interested in the subject, but the book is also by William F. Nolan, who's written a number of other books, both fiction and non-fiction, that I've enjoyed. I've read quite a bit about Hammett over the years, but this is the first actual biography of him that I've read. Not surprisingly, I already knew something about many of the events Nolan covers, but there was a considerable amount of information that was new to me as well, such as a detailed look at the abandoned novel that Hammett wound up turning into THE THIN MAN. I wasn't aware of just how many times he started other novels, only to give up on them, either. And this book includes the most detailed account I've read so far about the time Hammett spent serving in the army during World War II, stationed in the Aleutian Islands. Of course, I was most interested in all the stuff about Hammett's writing career. It's always fascinating to me to read about what an author wrote, for who, and how much he got paid for it. I love all those behind-the-scenes publishing stories. Nolan does an excellent job of striking a balance between presenting the facts and offering some critical analysis of Hammett's work without ever getting too heavy-handed about it. If anything, this book just made me want to reread the novels and stories even more, which I suppose is one thing a good biography of a writer ought to do. I don't know how Hammett scholars regard this volume, but I never claimed to be a scholar of any kind and I thoroughly enjoyed it. If you're a Hammett fan and run across a copy like I did, it's well worth reading. An excellent book, I recommend it highly. 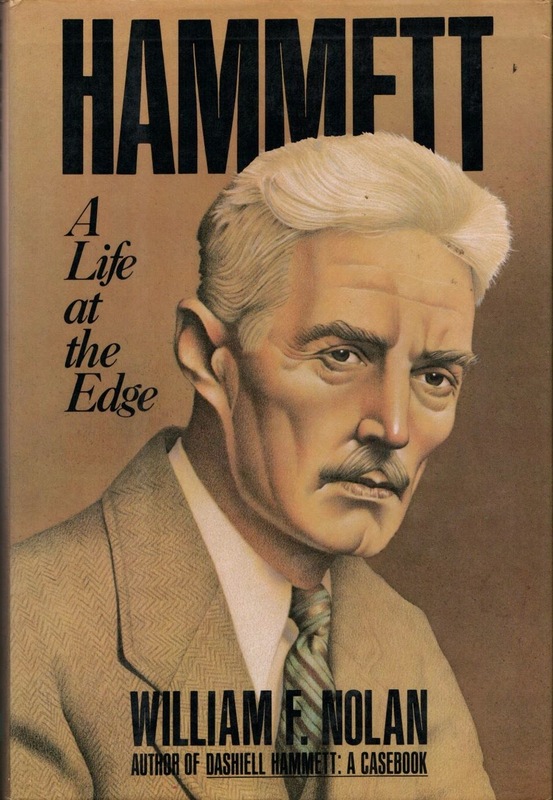 I've been reading Nolan's first (and THE first) Hammett bio, Dashiell Hammett: A Casebook. The guy's a VERY good writer. I'm going to have to start reading Hammett's novels before I read his biography. I'm familiar with William F. Nolan though I have not read anything by the author. I never would have guessed that there was a "Leave It to Beaver"-Dashiell Hammett connection. That sort of great info is one more reason I love the Internet. Talbot rejected his Beaver connection and became a socialist, which is how he got interested in Hammett. Odd that my quartet of introducers of lean, laconic prose into various fields of fiction, Hammett, Hemingway, Bloch and Heinlein, all had their socialist connections of various sorts as their careers began. Which is no skin off my nose, even if I admire the democratic socialists' beliefs more than the Leninists'...meanwhile, yeah, Nolan's always been good or good enough, and his THE BLACK MASK BOYS has been an entry drug for more than a few Hardboiled readers, I bet...as well as having fine annotation. I'll need to see his DH bios.